This week will be short and sweet. And while brief, hopefully instructive. 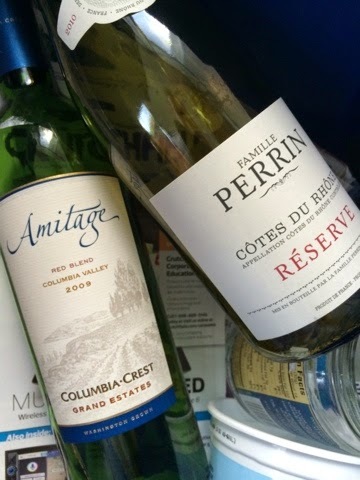 So, pictured here are two wines that have been reviewed and applauded here before. Why are they appearing again? Because these are the two wines which I have bought more of than any other wine in the last few years. That should be telling you a lot. In a world of inexhaustible variety and opportunities for exploration, why would anyone go back to the same well so many times? Because the water is just that sweet. The ridiculously named 2009 Amitage from Columbia Crest (reviewed, complete with the F bomb, here) is now down to $7.99 a bottle at the local grocery. I'd rather drink this balanced, generous wine than most $20-30 bottles out there. It's got ample fruit held up by a more-than-adequate structure, and a long, enticing (and slightly tannic) finish that confounds given the price. My guess is that the 2009 still has a few good years left in it, too. Then we have Famile Perrin's 2010 Cote du Rhone Reserve red originally reviewed here. Still priced and available widely at $10, it's versatility is holding strong in the warmer weather - holding up to grilled meats as well as it did to stewed dishes this winter. Wow, what a winner. As many bottles of these wines as I've picked up, ten-to-one I'll regret not having bought more. As an afterthought, we've got a brief revisit to Portugal with a bottle that made it past customs unscathed. 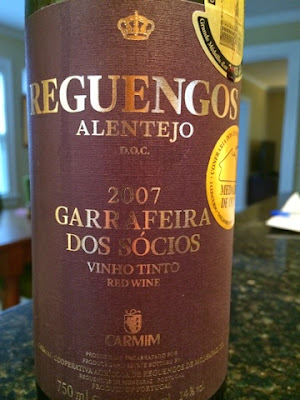 The 2007 Garrafeira Dos Socios Tinto from the Reguengos subregion of Alentejo. I'm guessing I paid around €14 for this aged Reserva quality red. For all the glory the Duoro gets, the informed consumer will keep their eyes out for wines from Alentejo. Unfortunately, most of what you find on shelves out there is so-so stuff like Monte Velho, but this is changing quickly. So, what does this wine taste like? Cabernet? Tempranillo? No. It tastes like a long, hard day of manual labor under an unrelenting sun, followed by a much-deserved meal full of good drink and laughter. There is more character in this wine than a shelf full of heavy history books. Grit, brawn, and tradition are doled out in abundance. Sigh.